Undergraduate students in their first year will be assigned to Ms. Lisa Marshall. During their sophomore year and after matriculation, students will be assigned new advisors at random. The Director of Graduate Programs serves as the student’s initial advisor, if not assigned one, until the student chooses one of the NE faculty members, as the advisor. No graduate committee is needed for the MNE degree. The Director of Graduate Programs serves as the student’s initial advisor, if not assigned one, until the student chooses one of the NE faculty members, as the advisor. After successfully finding an advisor, a graduate committee must be established with a minimum of three members, including the advisor, that serve on the committee. The chairperson will be the student’s advisor. The second (or co- chairperson) and third members may be from nuclear engineering or from another department’s graduate faculty with expertise and strength in the student’s chosen area of research. One of the members must be from another department that serves as the graduate school representative (GSR). If a minor is declared, then a member from the committee has to be from the minor department and can also serve as a GSR. a graduate committee must be established with a minimum of four members, including the advisor, that serve on the committee. The chairperson will be the student’s advisor. The second (or co- chairperson),third, and fourth members may be from nuclear engineering or from another department’s graduate faculty with expertise and strength in the student’s chosen area of research. One of the members must be from another department that serves as the graduate school representative (GSR). If a minor is declared, then a member from the committee has to be from the minor department and can also serve as a GSR. How do I apply to the Nuclear Engineering Department? To apply, please visit the Undergraduate Admission page. To apply, please visit the Graduate Application Portal. For information on undergraduate requirements, please visit Undergraduate Admissions. TOEFL/ IELTS – a required minimum TOEFL Internet-based Test (iTB) score for international students whose native language is not English of 18 on each part and a total score of at least 80. We also accept the IELTS exam (minimum score of 6.5 on each section). The distance program requires 30 credits in which 3-6 research credits are required for a project in which the students takes towards the end of their program. The MS option requires a thesis and a final oral exam. To schedule the final oral exam, a request form has to be submitted at least 10 days pior to the proposed exam date. The PhD program consists of 3 examinations. The Qualifying Exam (QE) has two componenets,Proficiency in course-work and Competency and Aptitude in research. To statisfy the requirement in the QE examination “Part 2: Competency and Aptitude in research”, PhD students complete a written report and provide an oral presentation within 8 weeks from the date of assignment; Students must complete part 2 by their fourth semester of enrollment in the program. The student’s adviser initiates Part 2 assignment [examples: journal article(s) or conference paper (s) or a selected research topic] and the formation of the Q-Committee of 3 members. The student’s adviser attends the presentation and participates in the comments and evaluation; the adviser is the chair of the committee but does not vote. After a student passes the qualifying exam, they may advance to the preliminary exam. The exam is initiated by the student by scheduling a request for preliminary examination and it is submitted to the graduate school. After a student passes the preliminary exam, they may advance to the final exam. The exam is initiated by the student by scheduling a request for final examination and it is submitted to the graduate school. Yes, the department funds almost all students in the graduate program. Funding from the department generally occurs in the form of teaching assistants (TA), research assistants (RA), or teaching-research assistants (TA/RA). In addition to departmental funding, faculty fund their students through grants in the form of research assistants. What is the Difference between TA, RA & TA/RA Appointments? Teaching assistants participate in the teaching mission of the unit as instructor of record, lab instructor, recitation leader, lab or lecture assistant, or who has responsibilities in direct support of classroom instruction in the unit, such as setting up labs or working in an instructional computer lab; or provides general support to the teaching mission of the department or program. Research assistants participate in the research mission of the unit, or an on-campus or off-campus organization that is affiliated with the unit, in the design of experiments, data collection, analysis, or reporting of research results in the student’s field of study, where research may, but is not required to, contribute directly to the student’s thesis or dissertation; or provides general support to the research mission of the department or program. Teaching/Research assistants is a hybrid of both, TAs & RAs, which participate in the teaching and research mission of the unit. Students with this appointment are expected to do both functions of teaching and research assistants. 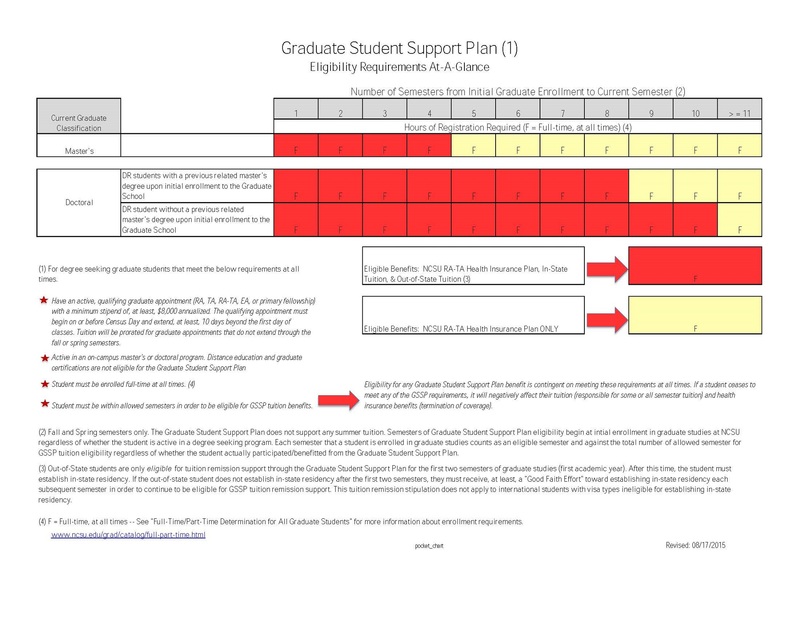 The Graduate Student Support Plan is a highly competitive support package used to attract top students to NC State University. Graduate students that meet the requirements outlined below are eligible to receive health insurance and tuition support (for a limited number of semesters). Master’s degree – 4 semesters. Doctoral degree with previous related master’s degree – 8 semesters. Doctoral degree without previous related master’s degree – 10 semesters. Every semester in which the student is enrolled counts against the total number of allowed semesters for tuition support, even if the student does not participate in the Graduate Student Support Plan. Qualifying students are only eligible for tuition remission support for two semesters (one academic year) – after those two semesters, the student must obtain in-state residency or a “good faith effort” toward establishing in-state residency each subsequent semester to continue being eligible for GSSP tuition remission support. Do students recieve health insurance? Student enrolled in the program, will automatically be enrolled in the Student Health Insurance Plan (SHIP), the University sponsored plan, and will be billed $1,270.00 each semester. If I already have insurance, can I waive out? Students who are already covered by an insurance policy (i.e. through parent plans, family plans, employer-sponsored plans, or student health insurance), and wish to waive out, must submit their insurance policy number for verification through the Student Blue Website. The charge is removed from the student’s bill once their policy is verified. Student will also need to decline (waive) coverage on the NC State RA-TA health insurance plan, please complete the form linked below. If the form is not working properly, please email your request to ncstate-gssp@ncsu.edu. Please remember include your name, student ID number, effective date of requested action, and briefly document the reason for declining coverage. If you are an international student, you are required to maintain health insurance throughout the duration of the I-20/DS-2019 — please do not complete this form unless you have alternative adequate health insurance coverage. Please see the Office of International Services for more information. More information on the benefits and waiver process is available on the NCSU Student Health Web site at http://healthypack.dasa.ncsu.edu/insurance-and-billing/ship/. Do I get health insurance under GSSP? The GSSP comes with a health insurance plan for the student receiving the assistantship. The student will be automatically enrolled in this insurance plan if he or she satisfies the requirements of GSSP. Graduate students supported under the GSSP will be automatically waived from enrolling in the UNC system-wide health insurance plan, Student Health Insurance Plan (SHIP). You may enroll in courses online via the MyPack Portal website using your valid Unity ID and password. Where do I find registration guidance? This link from Registration and Records explains the registration process and provides an Enrollment Wizard for easy enrollment. Please login into the MyPack Portal. Once in the students tab, the enrollment system is accessible. From here you can add and drop courses from your schedule. Courses can be graded in three different forms: graded, credit only, and audit. Graded courses are subject to the traditional grading system of A, B, C, D, F.
Credit only courses are subject to a pass/fail grading system of S/U for satisfactory or unsatisfactory. Audited courses are not subject to grades, but you will receive an AU if you fulfill the audit requirements and an NR for Not Recognized if you do not meet the requirements of the audit. Graduate students are allowed to audit one course per semester for no additional tuition cost. Consult with the course instructor to determine what must be done to successfully audit their course. Audit courses will appear as 1 credit but please be aware that this is an AU credit and does not count toward your program requirements. Information on registration deadlines, including late registration deadlines, is available here. Please enroll (register) for your courses prior to the late registration date to avoid a $100.00 non-refundable late enrollment fee. If you enroll during the late enrollment period, payment of tuition and fees will be requested at the time of enrollment. Enrolling for classes after the last day to enroll is strictly prohibited. In order to enroll after this day, students will need permission from the dean of their college and will be subject to additional late fees.Please note, UGS, PBS, Inter-Institutional, new undergraduate, and new graduate students are excluded from the $100.00 fee. How many credits must I have to be considered full-time graduate student? In order to have full-time status, students must be enrolled in 9 credit hours during the fall and spring semester. For summer, students must enroll in 1 credit hour to be considered full-time. The tenth day of classes each semester is Census Day. It is the last day to register or to add a course and the last day to drop a course or change from credit to audit with a tuition adjustment. Students should not change their schedule during the two-day period that includes Census Day. If necessary, a schedule change may be made after this period. IMPORTANT: Students who are not registered as full-time students on Census Day lose their eligibility for student loans, international students will be out of compliance with their visa requirements, and all students lose eligibility for the Graduate Student Support Plan (GSSP). How do I obtain residency? As of February 20, 2017, UNC General Administration now oversees and processes all residency determinations, reclassification requests, and appeals for all new and continuing undergraduate and non-degree seeking students. Therefore, all undergraduate or NDS students who are currently classified as out-of-state residents, who would like to apply for in-state residency for tuition purposes, are required to go through the North Carolina Residency Determination Service. Once you have received confirmation from RDS of a validated residency decision, you will need to provide or update your Residency Determination Number (RCN) in NC State’s self-service residency page: go.ncsu.edu/residencystatus.Instructions for completing the process are included on this page. Graduate students currently classified as non-residents who wish to apply for in-state residency for tuition purposes should apply through the “Online Tuition Reclassification Application”. This application is only for currently admitted and enrolled students. For more information on residency, check here. Can I transfer credits to the Master Program?? The course is classified as a graduate course. It was completed while the student was in a graduate or post-baccalaureate classification. It was not taken as a part of a previous master’s degree program at another institution. The grade in the course is B or better. Courses with grades of B- or lower will not be allowed to transfer. The college or university is accredited by one of the following six U.S. regional accrediting agencies: the Southern Association of Colleges and Schools, the Middle States Association of Colleges and Schools, the New England Association of Colleges and Schools, the North Central Association of Colleges and Schools, the Northwest Association of Colleges and Schools, or the Western Association of Colleges and Schools. Transfer of graduate credits earned while enrolled in a previous graduate degree program at NC State University. A graduate course that was completed while the student was enrolled in a previous graduate program at NC State University may be considered for transfer to a master’s program, provided that:(a) The course was a letter-graded (“A,” “B,” “C,” etc.) 500- or 700-level course and that the grade is B or better. Courses with grades of B- or lower will not be allowed to transfer. (b) It was not taken as a part of a previous master’s degree at another institution. Transfer of Post-Baccalaureate Studies (PBS) graduate credits earned at NC State University. A graduate course that was completed while the student was enrolled in PBS status at NC State University may be considered for transfer to a master’s program provided that it is at the 500 level or higher and that the grade is B or better. Courses with grades of B- or lower will not be allowed to transfer. All PBS credits that are used to satisfy requirements of a specific master’s degree must be earned before the student is admitted to that degree program. A maximum of 12 credit hours taken while in PBS status may be transferred into a master’s degree program. See Section 2.3 for information on admission to PBS classification.If a student’s graduate degree program is terminated, he/she cannot use courses taken in PBS status after termination for credit toward the same graduate degree program. Can I transfer credits to the PhD Program? For a student who has a master’s degree from a university other than NC State, a maximum of 18 hours of relevant graduate credit from the master’s degree may be transferred, upon the recommendation of the student’s Graduate Advisory Committee. Therefore, the minimum credit-hour requirement in this case is 54 credit hours. Students whose previous master’s was combined with a three-year bachelor’s degree from a non-Bologna institution to meet the minimum requirements for admission will not be entitled to this 18 credit allowance and will not be considered to have a previous master’s. If a student completes a master’s degree at NC State and continues for a doctoral degree without a break in time, up to 36 relevant credit hours taken while in master’s status may be used to meet minimum requirements for the doctoral degree. If there is a break in time between completing the master’s (at NC State) and beginning the doctorate (at NC State), the allowance is limited to 18 hours. Either allowance may include those 400-level courses taken as an approved part of the master’s degree. NE Graduate Meeting: Fall 2018 – information on who to contact, grants, HR, purchasing, travel and more. Download the PDF file NE - Graduate Student Meeting Fall 2018.